As a member of the International Coral Reef Initiative, CCMI is celebrating the third International Year of the Reef (IYOR) in 2018. Our theme for the year is “Zero Impact”. Everyone can have an impact on coral reefs. Unfortunately, reefs are under serious threats from human activity, climate change, invasive species and ocean acidification. Since reefs are such diverse and extremely valuable ecosystems – estimates say they are worth US $30 billion a year – it’s important that we all work together to safeguard the reefs for the future. You don’t need to be a scientist to help protect the most diverse marine ecosystems on earth. Whether you are close by or far away, everyone can do their part to keep our reefs healthy and vibrant. 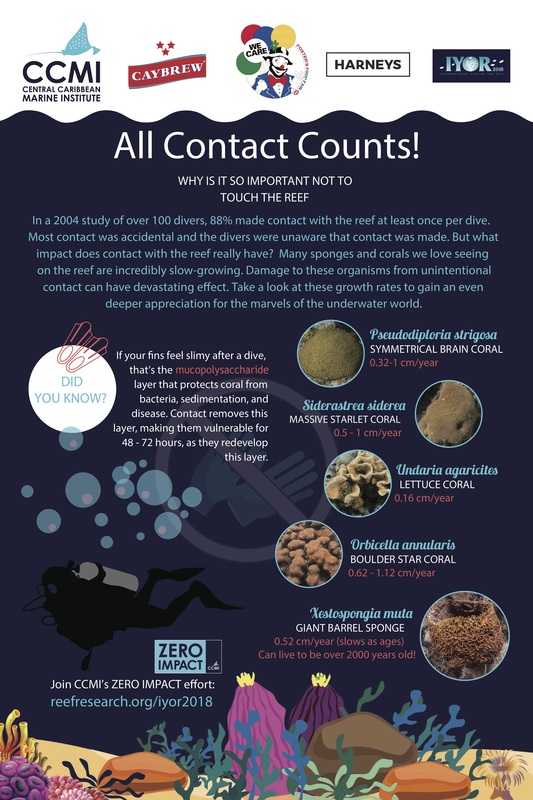 Help spread the word: All Contact Counts! Scuba divers and snorkelers often make contact with the coral reef, usually unintentionally, and sometimes without noticing. Many corals are very slow-growing, and even if the contact made with the coral seems minimal, it can have a lasting impact on their health and survival. 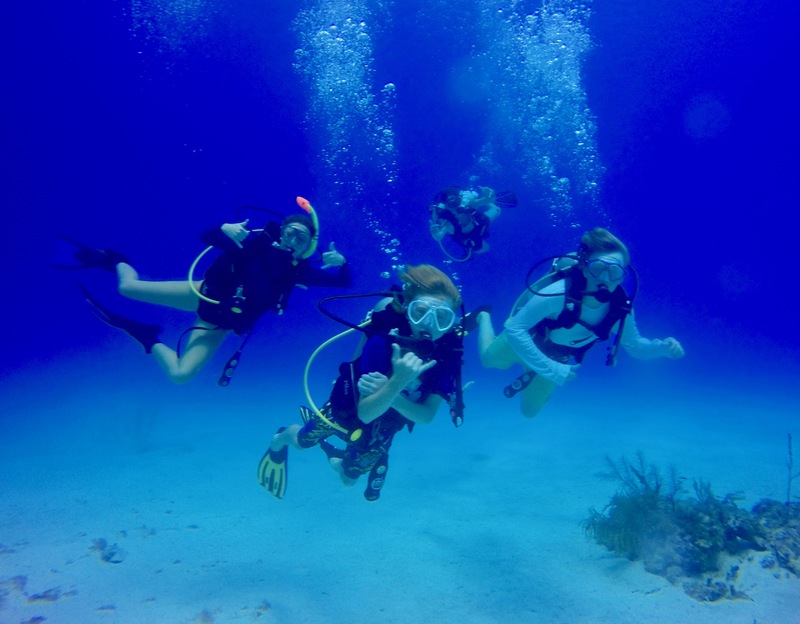 Our team at CCMI wanted to provide a bit more context behind why your dive instructor, snorkel guide, or marine-minded friends are so insistent that we not touch the reef. Take a look, and help us get the message out. To download the poster, click HERE. Alternately, contact us for a high-res version of the poster. Join us on June 9! Join CCMI as we celebrate World Oceans Day by participating in the international March for the Ocean and host a Reefs Go Live episode, live-streamed to the cinema. 1:00 pm: March in Camana Bay, wearing colours of the ocean and carrying signs that let the world know what you’re marching for. 1:45 pm: Reefs Go Live at the Camana Bay Cinema! 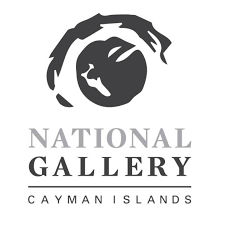 We’ll explore the topic ‘Can Coral Reefs Be Saved’ as we take the audience on a virtual underwater experience from Little Cayman while the CCMI team does their work underwater. Only snorkel or dive in water conditions (depth, visibility, surface conditions, etc.) which you are comfortable and confident in. Ensure that your equipment is fitted and secured appropriately so that you move efficiently and easily in the water and don’t make unintentional contact with the reef. Make sure you are properly weighted and If you are unsure of your control over your positioning in the water, give plenty of space between yourself and the reef. Contact with sensitive surfaces on corals and sponges can damage them (even if no visible impact is seen immediately), leading to stress, infection, illness, and mortality. Some reef creatures sting and scratch, as well. Even the sand and rubble patches are teeming with life, so try to keep contact to a minimum. Rapid movements can scare off many fish, but many are curious and will stay or even come closer if you are still, slow-moving, or approach at an oblique angle. Reefs are home to an abundance of life that you can see more of if you take your time. If you see garbage or old fishing line that you can remove, do so. There are also often reef surveys and research or conservation projects which you can contribute to while enjoying a recreational dive or snorkel by simply taking and sharing photos. Many sunscreens contain chemicals which are toxic to corals. Look into reef-friendly sunscreens and wearing clothing such as hats and long-sleeved shirts to protect from the sun. As you observe the reef, you’ll see beautiful creatures and complex interactions that you’ll surely want to know more about. Speak to other divers and snorkelers, consult fish books, and look online to understand more of what’s going on. Getting to know the underwater world on a deeper level will only enhance your experience. If you see that others around you are intentionally or unintentionally having an impact on the reef, don’t stay silent. Sharing information that you have about how and why to be a good steward of the reef in a friendly manner will help us all to do better. You can make a difference with the choices you make in terms of dive centres and tour operators. By patronising businesses that are proponents of conservation, you are demonstrating your values as well. You can also make many choices in your everyday life to reduce your impact on the environment. Many reef fish are overharvested, which is leading to declines in the health of coral reefs. Choose better options for your fresh fish dinner with help from our friends at the Cayman Islands National Trust and their Cayman Sea Sense programme. This mnemonic device we learned as children is truer now than ever. 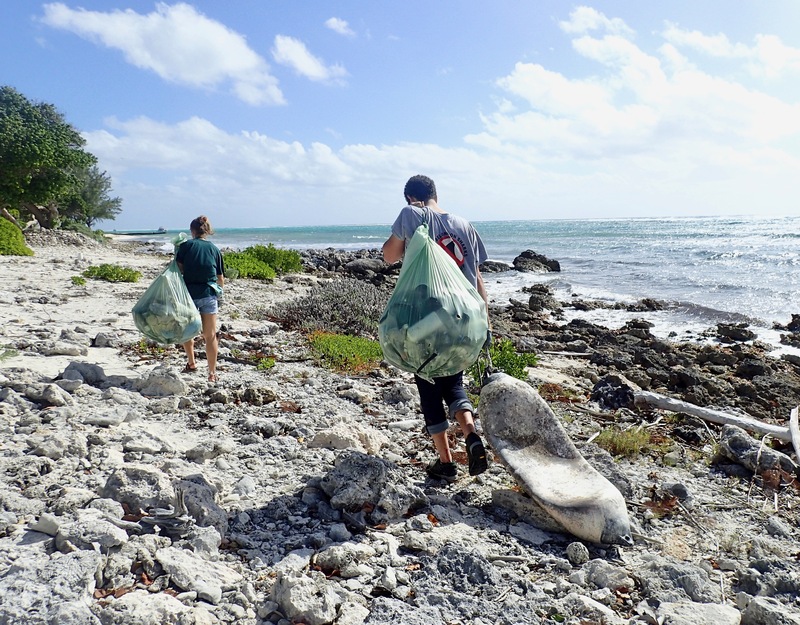 If we can reduce our consumption, particularly of items that are disposable or single-use, reuse what we have, and recycle properly, we can go a long way to helping cut down on marine debris and toxic impacts to reefs. Give the plastic bags a miss when you head to the store. Many reusable bags are compact enough to carry in your purse or backpack or keep in your vehicle. Less fuel burned in our vehicles means conditions will change more slowly, allowing coral reefs to adapt to the changes in the climate. Donate to CCMI’s coral reef research and coral nursery programmes to help us have even more impact in the Caribbean. Share your passion, interest and actions with a friend, encouraging them to also have ZERO IMPACT on our coral reefs. H.L. Barker, Nola & Roberts, Callum. (2004). Scuba diver behaviour and the management of diving impacts on coral reefs. Biological Conservation. 120. 481-489. 10.1016/j.biocon.2004.03.021.